Here are a few questions. Is the UDA still illegal? Is the UVF still illegal? If so, how would you know? Can anyone remember the last time anyone was charged with membership of either group? Can anyone remember the last time anyone was arrested and questioned about membership of either group? Since the very first outburst of violence at Belfast City Hall on December 3, senior police officers have been briefing the press and saying publicly that ‘known UVF members’ were seen fomenting disturbances. 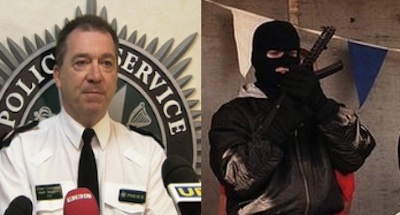 The chief constable, using hair-splitting weasel words, has said UVF members ‘as individuals’ have been organising disturbances in east Belfast. By using that terminology he carefully avoids any suggestion that the UVF has broken its ceasefire and should therefore be ‘specified’ as in breach. The media, the press in particular, almost on a daily basis, identify named individuals as “a senior UDA figure” or “the leader of the UDA who is based in Sandy Row” or who is a so-called ‘brigadier’ in some part of Belfast. Incidentally, most of the people so identified have been regularly meeting senior DUP politicians. Some of them were publicly glad-handed at the Unionist Forum. We’re also told senior police officers met UVF leaders last week. Is this not an extraordinary state of affairs that such double standards apply at the highest levels in policing and in what passes for politics in Northern Ireland? No, not in the least. It has always been the case. It’s just that these days the police in particular are more open about it. Sadly it seems that the PSNI is just as ambivalent about unionist paramilitaries as unionist politicians have always been and the RUC was before them. Can you imagine the uproar if senior police officers said known IRA men were organising riots? Can you imagine the same police meeting the IRA to negotiate an end to the riots? There’s another crucial difference, The IRA has gone away yet the police are still pursuing individuals to charge them with membership years ago. On the other hand it is crystal clear that neither the UDA nor the UVF has gone away. On the contrary, its members are still active as they always have been in subverting and polluting the working-class communities they have always blighted with the help and indulgence of the security forces. Why is it impossible to get through to police and unionist politicians alike that people in the districts dominated by these organisations don’t like them, don’t support them and want them off their backs? Repeatedly front parties for these organisations have stood for election and what is the result? A fraction of one per cent of the vote, Laughably even UDA members don’t vote for UDA candidates so unionist politicians have absolutely nothing to fear from these organisations. As for the police, they know perfectly well people in the districts in question have no time for the UDA and UVF and would love it if the police acted to get rid of their baleful influence, Instead they are elevated to the role of permanent state employees as ‘community workers’. Sometimes we’re even told they are ‘community leaders’. Says who? Let one of them try to get elected as a community leader in a secret ballot. This deeply unsatisfactory relationship between the PSNI and unionist paramilitaries is compounded by the failed strategy the chief constable has been following by not dealing with people blocking roads and by permitting the Parades Commission legislation to be flouted on a weekly basis. Does he not realise his flawed approach is storing up serious trouble for his officers in the summer when they try to enforce legislation they have been ignoring since December 3? Perhaps more importantly his inaction, apart from costing business in Belfast around £15 million and unknown losses in terms of inward investment, is seriously damaging nationalist confidence in the police. Does he imagine for a second there would be a unionist uprising if people blocking roads were pushed aside when in many cases the people demanding their removal are unionists? Yes, the PSNI has passed the test defending the Short Strand and taken many injuries but there’s a wider picture which the chief constable seems unable to see.